It's Secret Recipe Club time again! This month I was assigned Manu's Menu. Manuela has tons of mouth-watering recipes on her blog. It was hard to choose just one. I finally decided on this Coconut Creme Brûlée since I had a shiny new kitchen torch that I wanted to test out. 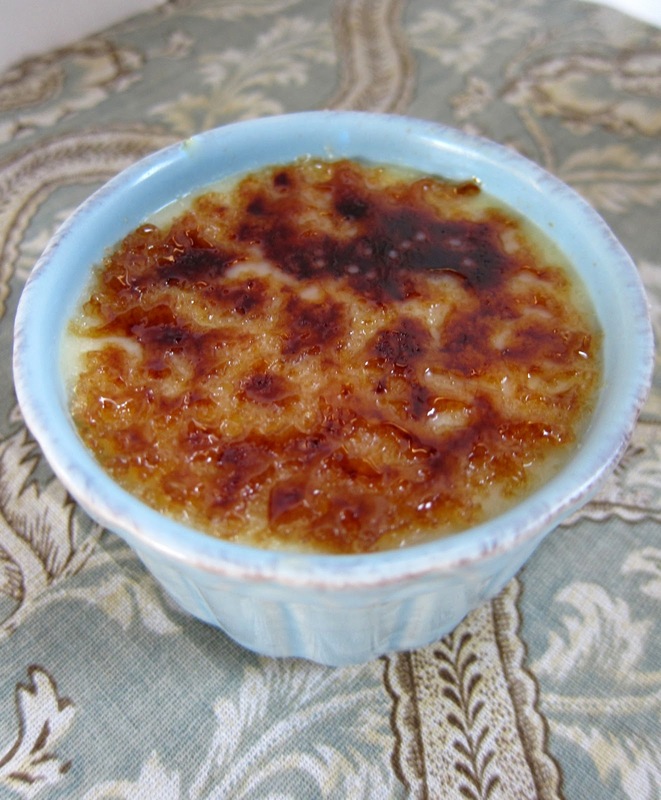 The creme brûlée was really easy to make and this version didn't require any baking. It tasted fantastic! We both scraped our ramekins clean. It was very creamy - much creamier than other creme brûlée we've had. We both said this was the best creme brûlée we ever had. Seriously! Make sure to check out all the other fabulous recipes at Manu's Menu. I already have several bookmarked. Put the coconut cream, cream and half the sugar in a pot and heat it on a slow flame until almost boiling. Separate the egg whites from the yolks. For this recipe, you will not need the whites. Lightly whisk the egg yolks, the remaining sugar and flour in a bowl. Remove the cream from the fire and add the egg mixture to it, whisking constantly to prevent the yolks from curdling. When well mixed, put the pot back on the fire and cook it on a very gentle flame, stirring continuously, until the cream thickens enough to coat the back of the spoon. Remove from heat and stir in vanilla. Pour the mixture into the ramekins and let the cream cool down. Put it in the fridge for 1 hour. When it is cold sprinkle the top with brown sugar. Melt the sugar either with a blowtorch or by putting the ramekins under the grill. When the sugar becomes caramel brown they are ready. Then let it cool and place the cream back in the fridge for at least 1 hour. Serve cold. Perfect way to end a meal! I agree, Manuela has so many fantastic recipes! I will make brulee, I will make brulee...I keep telling myself that but alas I haven't. I think I've found the recipe to motivate me now. Oh, yum!! I adore a great brule! What an awesome undertaking for SRC! I would have been too scared to try a Creme Brûlée but your's looks perfect! Fantastic! Coconut and Creme brule in one gorgeous package. What a great recipe (and pics). Great SRC post! Custards, puddings, flan...anything that resembles them are my favorite. You got a wonderful blog for SRC. Manuela has a wonderful blog. Looks like you picked a really good recipe too. You cant go wrong with Creme brulee. Thanks for sharing with all of us. I love coconut and creme brulee. What a great combo. I need a torch! I love cream anything, especially if it's sweetened into a brulee. It's super simple too - I could actually make this tonight. Nice to meet you! Wow what a great creme brulée and a more guilt free then the traditional kind. I saw your entry quick this morning and you beat me to commenting first. Bookmarked! We are big creme brulee fans in my house so I can't resist trying this version with coconut milk. I often have left over egg yolks so I'm very happy to have this recipe. mmm love it! and I love the fact that you have a new torch for the kitchen! haha aren't they fun?!?! Your brulee looks amazing! I have had a torch since hubby and I got married 9 years ago and have never used it. I wonder if it still works. I've been wanting to make creme brulee for hubby. He loves coconut and I will have to make it for him. Thanks for sharing! Just checked out your About page...your kitties are adorable. We have 3 as well. 2 tabbies and a black and white tuxedo kitten we just adopted a few months back. Loving getting to know everyone in SRC. Group C rocks! How much do I want to dive into this creme brûlée?! I found you just now and I have to say WAR EAGLE from one AU alum to another! Your recipes are making my mouth water. A QUICK Creme Brûlée with coconut milk - I don't see how one could beat that. It's sounds delicious! Creme brulee is one of my favorites as is coconut anything! I will be saving this recipe for a later date! Looks and sounds amazing! I love creme brulee but have never had it with coconut in before. Any excuse to get my blowtorch out though.. I love coconut anything, and this sounds especially great!